To say I was over excited yesterday was an understatement. I've been looking forward to a delivery from America and its here. Sent with oodles of Graphic 45 love from Portland. Thank you Diane, Charee and Aimee once again for your amazing generosity. I'm up to my knees in the Christmas collection but had to take time out to have a browse thought the pads. 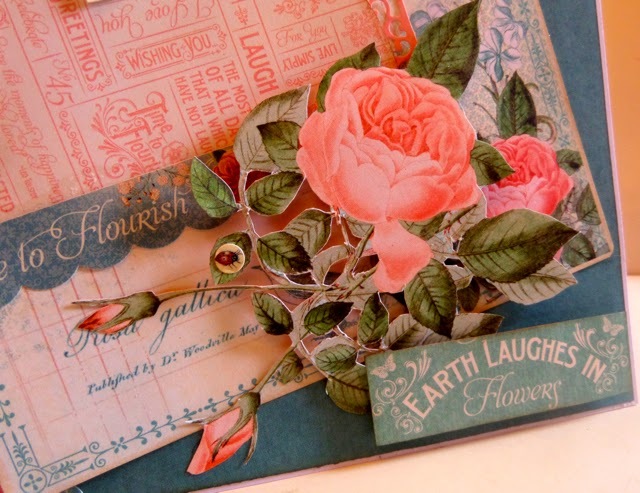 If you haven't seen the Time to Flourish collection yet, here's a short vid and some close up pics of the papers. The whole collection is full of the most amazing detail and stunning imagery that Diane and her team of designers create for us to get crafty with. Every page takes you on a journey throughout the seasons, and many of the pages coordinate with older collections too. There's an addition to the collection time, a full 8 x 8 calendar pad and separate one with cut outs and patterns. A definite for the Christmas pressie list if you haven't ordered already. Talking of Christmas I have to head back to the Night before Christmas and get a wiggle on with our album for the retreat next week. I've set myself a target of two more pages, cut out, instructions written and videos done before I head over to Daisy's Jewels and Crafts later for a jam packed Christmas Sleigh class. Looking forward to seeing you if you're coming along. Clare these papers are so gorgeous!! I am glad to see Graphic 45 coming back with pretty pretty colors!!! I just sent for these pretty papers!!!! Can't wait to get them!!! Love, love, love what you do and thank you for sharing with us!! Your friend Judy in Arizona!! Absolutely gorgeous!!!! My list of ideas and projects are buzzing as well!!! Thanks so much for sharing. I am excited for this one as well! :) Graphic 45 never let's us down!! Hi Clare, Gorgeous, gorgeous, gorgeous, Graphic 45 never disappoints !! Enjoy your weekend, I hope you get time for a bit of R&R haha.